While a tan was once associated with a well-deserved vacation or carefree summer, it is now symbolic of damage to the skin. For this reason, patients are advised to shield their face and body from the sun’s harmful ultraviolet rays year-round with a broad-spectrum sunscreen, hats, and protective clothing. Unfortunately, many adults have experienced intense sun exposure and burns in their early years or cumulative UV damage over a lifetime. These factors increase an individual’s risk for developing pre-cancerous moles and skin cancer. So, how do patients determine if it’s just a mole or something more serious? Here’s what you need to know about the different forms of skin cancer. Skin cancer develops when the sun’s ultraviolet rays cause unrepaired DNA damage to skin cells, leading to genetic defects and mutations. As a result, these abnormal skin cells multiply rapidly and create malignant tumors. Atypical moles often look like melanoma, but are in fact benign. These moles have a strong genetic component and are more common in Caucasian patients. They may present as multi-colored, irregularly shaped, and larger than an eraser head, but are non-cancerous lesions. However, having 10 or more atypical moles, a past history of melanoma, and a first relative with melanoma are all risk factors for melanoma. Actinic keratosis is an abnormal growth that can lead to cancer (usually squamous cell carcinoma) if left untreated. It is caused by UV rays from the sun or tanning beds and usually appears on frequently exposed areas such as the face, scalp, ears, shoulders, neck, back of hands, and forearms. AK often occurs as multiple growths that are crusty, scaly, and wart-like. They are usually red in color, but can also be tan, white, pink, or flesh-colored. In addition, these lesions may be itchy, tender, and feel very rough to the touch. Basal cell carcinoma is the most common form of skin cancer and occurs in the basal cells that line the deepest layer of the epidermis. These lesions are caused by cumulative, intense, or occasional sun exposure. BCC can be identified as open sores, red patches, pink growths, or shiny bumps. Fortunately, these tumors do not usually spread to other parts of the body. Squamous cell carcinoma is caused by abnormal skin cell growth in the upper layers of the epidermis. Cumulative, daily, and/or intense exposure to ultraviolet rays can all contribute to SCC, which can occur on all parts of the body. Scaly, red patches, open sores, elevated growths with depressions, or wart-like growths are all signs of this form of skin cancer. These lesions can also crust and bleed, and result in disfigurement if not diagnosed and treated. Melanoma is less common than basal or squamous cell carcinoma, but can be much deadlier. It forms in the cells that are responsible for skin’s pigment and is caused by intense, occasional UV exposure. Lesions diagnosed as melanoma are often black or brown in color, but may also be flesh-colored, pink, red, purple, blue, or white. When melanoma is diagnosed and treated in its early stages, it’s usually curable. However, it left untreated, it can spread to other parts of the body. Patients should examine moles monthly for any asymmetry, irregular borders, color changes, diameter larger than six mm, and evolution of the mole from month to month. Merkel cell carcinoma is diagnosed far less often than melanoma, but causes much higher rates of mortality. It most often occurs on sun-exposed parts of the body, and patients with fair skin and are over the age of 50 are at greater risk. MCC appears as red, blue, or flesh-colored lumps, and has a high rate of reoccurrence and metastasis (usually within two years of initial diagnosis). 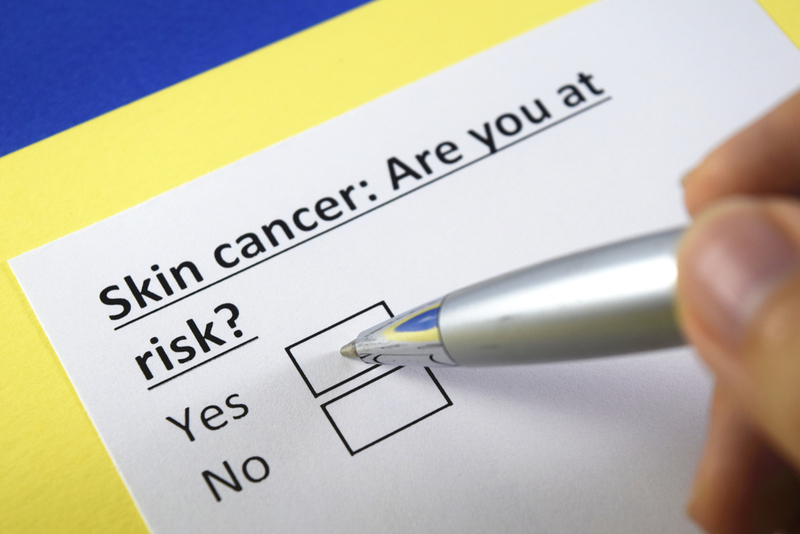 For more information about pre-cancerous lesions and skin cancer, please call Hagerstown Dermatology & Skincare today to schedule your annual screening.